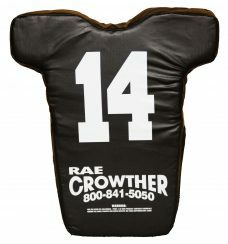 SHELL STICK - Rae Crowther Co.Rae Crowther Co.
Use the Shell Stick as a way for players to learn how to properly utilize a stiff arm when running to the perimeter. The Shell Stick has a built in shock absorbing mechanism so that the coach or players does not get hammered from repeated contact. Proper placement on the face-mask not only gives a realistic feel but it also teaches players how to avoid penalties when stiff-arming. On defense use the Shell stick to defend against cut-blocks. 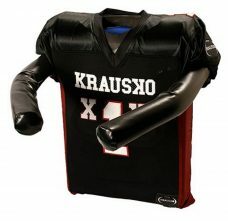 Placing one hand on the helmet and one hand on the shoulder pads give players a game-time feel on how to attack and defend against a player trying to lunge at their feet. 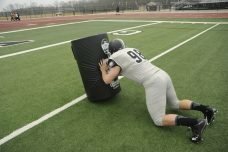 Use the Shell Stick to teach running backs how to take on contact with their shoulder and not their head. Younger players tend to dip their head when they’re about to take on contact. 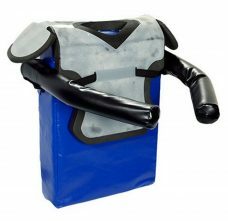 Use the Shell Stick’s shoulder pads as a way to provide “soft contact” to players as they are running to see how they react to contact. Warranty 2 years. Check out the Shell Stick in action!